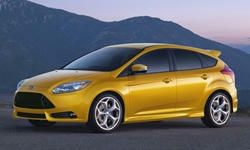 Ford Focus Pros and Cons | Page 1 of 5 | Why Not This Car? What drives people to buy (or not buy) a certain car? TrueDelta's members share Ford Focus pros and cons based on their real-world driving experiences. I got this car in April of 2016 it was a 2015 Ford focus with 5 speed, it had 1800 km on it and i paid 12,900.00. Car was perfect no marks or any thing. I put in cruse control $350.00. On highway it gets 40 miles per gal. Nice to drive. Feels really close to the road. The Ford Focus, Gen2 is about the essentials: a no -frills grocery getter with added bonuses. Worst car I have EVER owned, will NEVER buy another ford. EVER. Be sure and buy the EXTENDED WARRANTY every time you purchase a FORD product. Because you will need it. The 2002 Focus Zetec has been relatively reliable - however, one nice thing is that almost everything that has failed on it has been fairly inexpensive and a well known issue - i.e. For decades auto industry analysts have been talking about the increasing need for scale. Cars have become so technologically complex, and buyer expectations have risen to such lofty heights, that a sub-gargantuan company won't have the requisite resources to develop competitive cars. Great buy. Great styling, handling , space and mpg. We got this 1.5 yr old used car with 17K miles for less than half the sticker price and we have no regrets. Our target car at the time was a Nissan Sentra, but we couldn't turn down the deal. the Focus ST is a real do-it-all American car. In a market segment that has, until now, suffered through value only product lines, the Focus lineup brings upscale features to US economy cars. With the ST, not only does it match other hot-hatches with performance, it matches larger sport sedans with its balanced handling and low-end torque. I like this car - handles well and gets great fuel economy. However if I were to re-do I might have bought a slightly bigger car like a fusion.